The Entrance is located on the East side of Dragonblight. It's a floating ziggurat close to Venomspite/Wintergarde Keep. 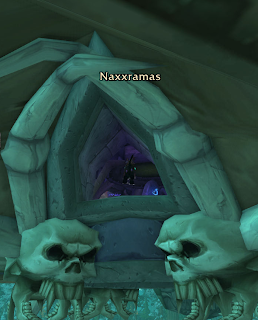 To enter the dungeon you have to fly in from below. 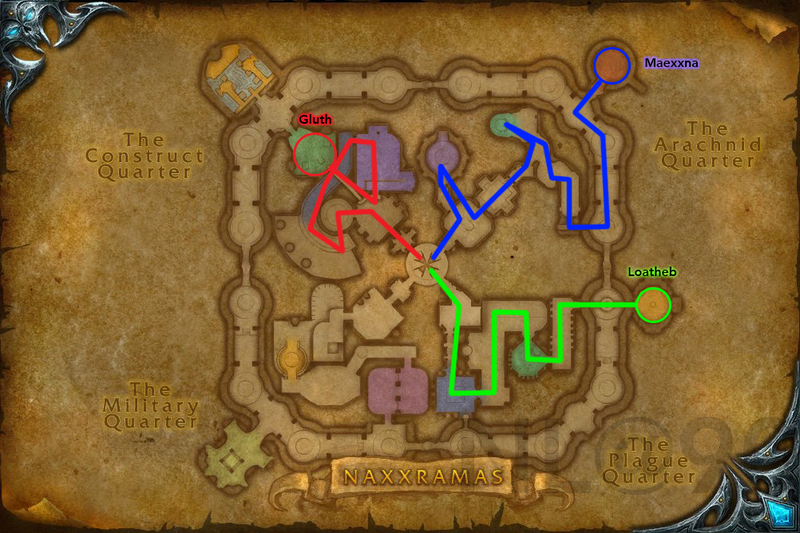 To get to the bosses that drop pets, you have to clear two other bosses in your path in each wing. 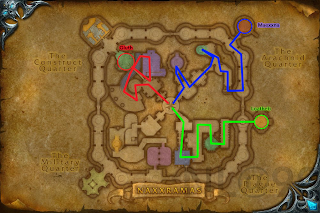 I like to start with Maexxna or Loatheb and save Gluth for last because Maexxna and Loatheb both have portals to take you to the entrance after you kill them. Anub'Rekhan - Easy kill, there might be adds, you can deal with them after you kill the boss. Grand Widow Faerlina - She does an enrage that can only be soothed by the adds on the platform with her, just aoe them down and she should die quickly. Maexxna - She'll web someone to the wall if there's more than one person in the room, do damage to the web to break it. She also enrages at low health, shouldn't be a problem. Noth the Plaguebringer - Ignore the adds and kill him before he teleports away, or you have to wait for him to come back. Heigan the Unclean - If you're melee just stay on his platform and beat him down. If you're a caster it's a little more complicated, since he casts spell disruption that decreases casting speed by 300% around him. You'll have to stand at a distance. You have to watch the floor between phases and move to spaces on the floor that aren't erupting in green, it goes in waves and it's pretty easy to dodge once you get the hang of it. Loatheb - You won't be able to heal for much of the fight, necrotic aura is cast very frequently. Spores will start coming to you once you engage him, kill these to get a 50% crit buff. Should be able to kill him before he kills you. Patchwerk - Kill him before he kills you, the last 20% he starts to hit really fast, so pop your defensive cooldowns then. Make sure you clear the entire room before fighting him, they all aggro if you pull him. Grobbulus - Stay out of the poison clouds he drops under himself, he uses slime spray as a frontal cone but I didn't see him do this when soloing. Yes, the trash in his room also engage you if you don't kill them first. Gluth - I had a friend who said he wasn't able to kill him on 25m, he's easy on 10m though. Just drag him to the end of the room and kill him, ignore the zombies, he'll eat 1 or 2 but you should be able to burn through any extra health he gets back. You can cc zombies if you're fancy.